By 1869, there were six colonies in Australia – New South Wales, Tasmania, Western Australia, South Australia, Victoria and Queensland – all settled by British people. These separate colonies all had their own governors, parliaments and systems of government reporting to Britain. As the interior was explored and mapped, squatters and free settlers followed and Aboriginal people were pushed from their homelands. Governments wanted to protect Aboriginal people from settler violence. By the 1880s, many Australians believed that Aboriginal people were dying out. In 1788, there had been over 300,000 Aboriginal people in mainland Australia, but by 1888 there were an estimated 80,000. Colonial Governments’ believed that the best way to help Aboriginal people was by a policy of Protection. This policy lasted from the 1880s to the 1930s. Aboriginal people were encouraged to live on government reserves and church missions far away from other Australians. They were given food, clothes, blankets and sometimes basic education. Squatters and settlers often used Aboriginal people from the reserves as cheap labour or, in some cases, as slaves. 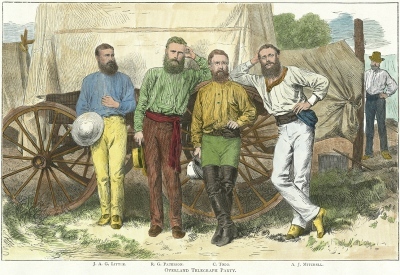 The discovery of gold sent a shock wave through Colonial Australia. In 1851, Edward Hargraves convinced the people of Sydney that there was payable gold just outside of Bathurst in New South Wales. Within a month, 300 prospectors were in the area looking for gold. 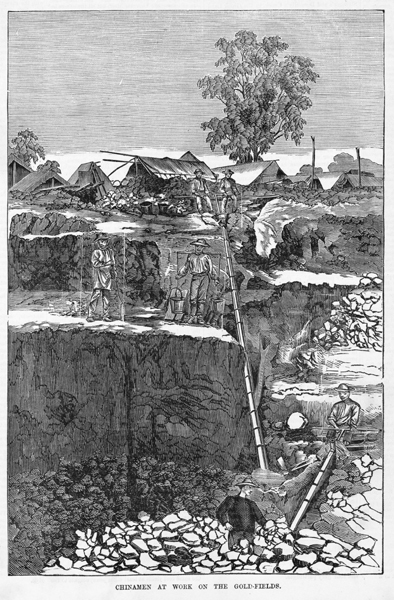 Soon payable gold was found in Victoria near Ballarat and Bendigo and people began streaming to the two gold fields, resulting in a gold rush. With so many people leaving for the gold fields, many businesses found it hard to keep operating. 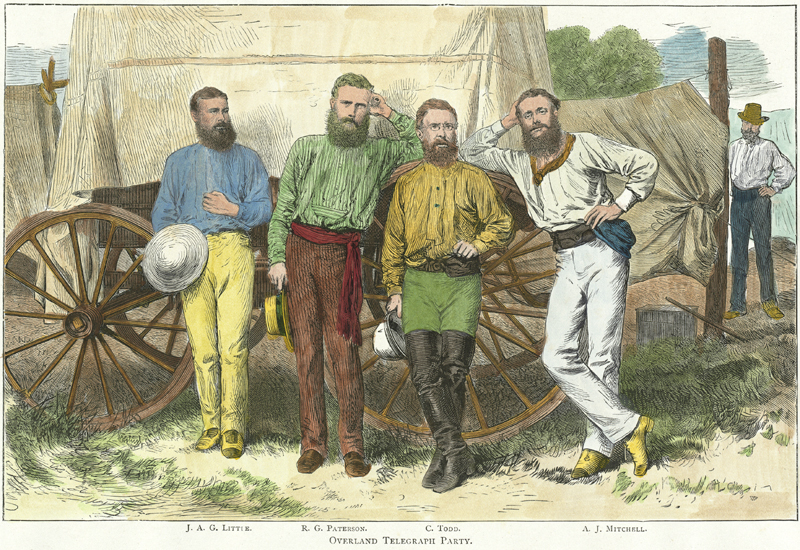 People began to act irrationally with gold fever, spending all their savings and abandoning their families to get to the gold fields. Mining towns grew overnight at Sofala, Hill End, Ophir, Forbes and Lambing Flat. Ships crews deserted, leaving vessels stranded in port, shepherds left their flocks and government officials, clerks, teachers and policemen left their jobs in the excitement. Immigrant ships brought thousands of people keen to try their luck at the diggings. The sailing time from England was reduced to 80 days and the newcomers, like the migrants before them, endured appalling conditions under unscrupulous shipowners. While people migrated from all over the world during the gold rush most came from Scotland and England, followed by a large number of Chinese diggers who were often victimised on the gold fields. The Chinese diggers moved from goldfield to goldfield within New South Wales and across the border. Constantly on the move, their presence and experience are evidenced mainly from the observations and interpretation of Anglo-Australians, from archaeological digs and from objects saved by families and community members. There are few written accounts and sources from a Chinese perspective. The Chinese attracted particular attention and local newspapers were quick to comment on their distinctive features, clothes, languages and habits — especially their tendency to travel en masse — their methods of transport, their diligence, tirelessness and productivity. Any admiration of their work ethic was offset by envy and resentment when times got hard. The Chinese were often scapegoated as seen in the violent anti-Chinese riots at Turon in 1853, Meroo in 1854, Rocky River in 1856, Tambaroora in 1858, Lambing Flat, Kiandra and Nundle in 1860 and 1861 and Tingha tin fields in 1870. 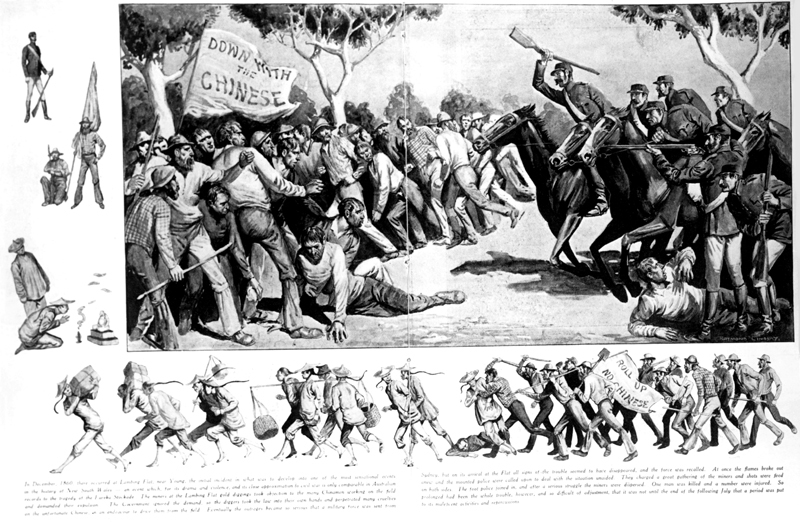 The Chinese were seen initially as oddities, later as rivals and then as threats to white Australia. In time people realised that gold was not the bonanza they anticipated and they began to filter back into cities and towns looking for work and places to live. They noticed that large areas of land were not being used and wanted the chance to establish farms like the squatters had done before them. With an increased population came further demand for land, food, clothes and buildings and the Australian economy grew to accommodate these needs. Another impact of this large influx of migrants was that ideas of the rights of the individual, democracy and egalitarianism were imported from Europe and the United States. Up until the 1850s, only landowners and squatters had the right to vote. People began to demand one vote for one man. Soon women demanded the right to vote. Colonial governments sought to free up more land for all these people. The 14-year leases granted to the squatters had ended by 1861, and colonial governments passed new laws to free up land and raise revenues. Between 1858 and 1872, all the colonies passed Selection Acts. In New South Wales the Acts were called the Robertson Land Acts. People could select a plot of land which they could then buy cheaply at auction. They then had to live on the land for a year and make improvements such as constructing huts, sheds, dams and fences. To cheat selectors out of land, squatters used friends and employees to put ‘dummy’ claims on the best land with water. In the towns and cities, many people sought jobs in new manufacturing industries and new suburbs expanded across Sydney. Services like water, sewerage and transportation were slow to be introduced and public health issues became a problem. Women who came to Australia to work as domestic servants found that their pay and the employer’s attitudes were not good and that better wages were on offer in food and textile factories. Migrants skilled in mining, steel milling and maritime trades were targeted with promises of better conditions and pay. During the 1870s and 1880s the economy was booming, but a severe drought lasting four years from 1890 crippled the economy, resulting in widespread unemployment, poverty and industrial strikes. 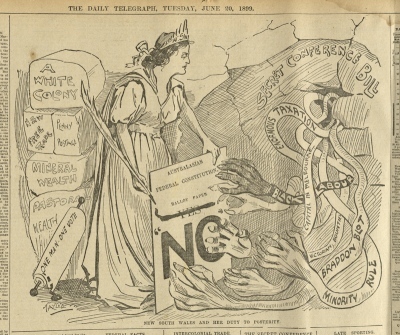 As a result of this economic depression, the colonies created a federal system of government that administered wages and conditions, defence, post and telegraph, immigration and social welfare. 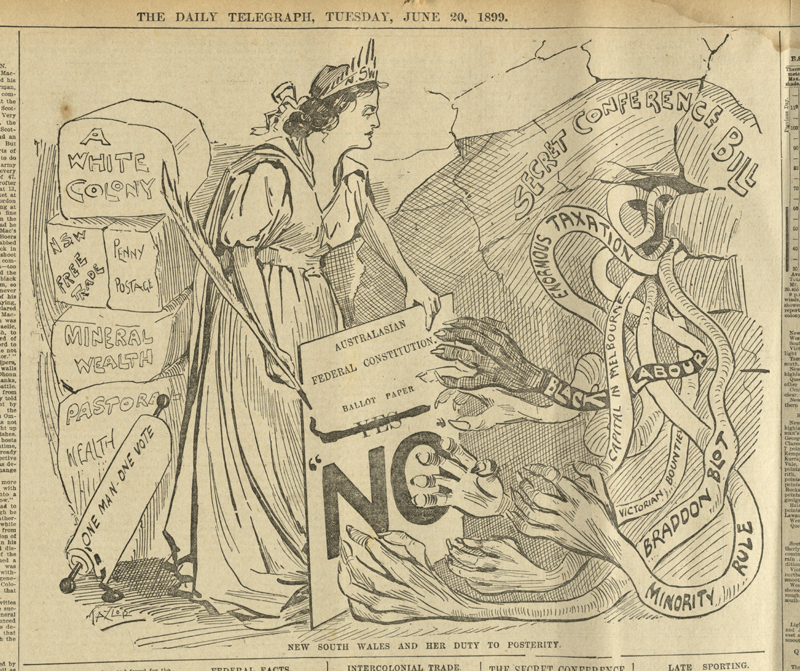 The labour movement realised that industrial strikes would not achieve the progressive reforms they desired and political representation and government was the solution. The Australian Labor Party was formed in 1891. The North Head Quarantine Station post office stamp is historically significant because it is evidence of the experience of those quarantined at the North Head Quarantine Station. The trunk is historically significant as an object directly related to the journey of a German migrant of the late 19th century from Hamburg to South Australia and then to the Riverina.